A new Agilent 7700x ICP/MS has been installed, validated and currently running samples for EPA Methods 200.8 and 6020. 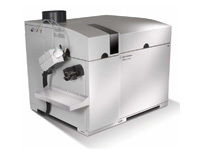 The instrument is about twice as sensitive than our previous ICP/MS Agilent 7500ce model. The new instrument is equipped with an Integrated Sample Introduction System (ISIS) which increases sample throughput while reducing difficult matrices such as seawater and brines samples. The addition of this instrument increases our capacity while allowing us to further segregate methods and matrices to streamline processing of samples, resulting in enhanced turnaround time for our customers. Additionally, new method development is an on-going process at Weck Laboratories, with new protocols coming on-line such as trace metals in nutritional supplements by United States Pharmacopeia (USP) methods <232> and <233> employing microwave digestion followed by ICP/MS determination.